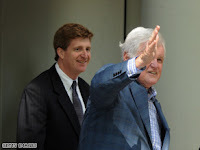 For those that missed the news this morning, Senator Kennedy opted to have brain surgery today at Duke. The surgery was scheduled to start at 9am and would last several hours. Good luck to our Senator and best wishes to his family. I am deeply grateful to the people of Massachusetts and to my friends, colleagues and so many others across the country and around the world who have expressed their support and good wishes as I tackle this new and unexpected health challenge. I am humbled by the outpouring and am strengthened by your prayers and kindness. Over the past several days, Vicki and I, along with my outstanding team of doctors at Massachusetts General Hospital, have consulted with experts from around the country and have decided that the best course of action for my brain tumor is targeted surgery followed by chemotherapy and radiation. This morning, I will be undergoing surgery with Dr. Allan Friedman at Duke University Medical Center and expect to remain there to recuperate for approximately one week. Shortly thereafter, I will start radiation treatments at Massachusetts General Hospital and begin chemotherapy. After completing treatment, I look forward to returning to the United States Senate and to doing everything I can to help elect Barack Obama as our next president. Click (here) for a CNN article with more details about the surgery. 0 Response to "Good Luck to Senator Kennedy"